Farming Simulator 19 is an amazing realistic farming simulator from Giants Software. Take control of vehicles and machines faithfully recreated from all the leading brands in the industry, including for the first time John Deere, the largest agriculture machinery company in the world, Case IH, New Holland, Challenger, Fendt, Massey Ferguson, Valtra, Krone, Deutz-Fahr and many more. 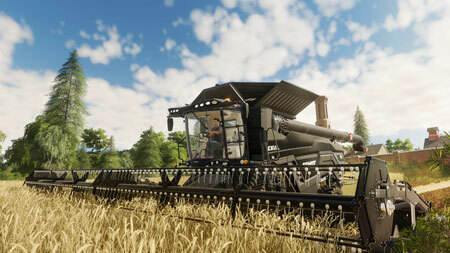 The game will feature new American and European environments in which to develop and expand your farm and will introduce many exciting new farming activities, including new machinery and crops with cotton and oat. Tend to your livestock of pigs, cows, sheep, and chickens – or ride your horses for the first time, letting you explore in a brand-new way the vast land around your farm. If you get stuck in the game, check out the video walkthrough and gameplay for the game. This entry was posted in PC Games, Walkthrough and tagged Farming Simulator 19 Cheats, Farming Simulator 19 Game, Farming Simulator 19 Gameplay, Farming Simulator 19 Guide, Farming Simulator 19 Hints, Farming Simulator 19 Ravenport, Farming Simulator 19 Review, Farming Simulator 19 Solutions, Farming Simulator 19 Strategy, Farming Simulator 19 Tips, Farming Simulator 19 Walkthrough by Marvin. Bookmark the permalink.